Not that I need to start a new project, but I saw this pattern in the Quilt Sampler magazine Spring/Summer 2008 called Circle of Scraps and just fell in love with it! But I did not like the way the borders looked and prefer more happy colors, so I got busy on my EQ6 and came up with my own version. I did a version with black background and cream background. My daughters like the black, but I prefer the cream as you can see the circles better. Here is the Circle of Scraps from the Quilt Sampler magazine. It is simply the Kalaediascope block, but it sure makes a pretty quilt. The thing I did not like about this pattern was the way the points got chopped off in the border. By the way...if you have not tried this magazine, it has to be my absolute favorite. Comes out twice a year and features 10 quilt shops around the country. I read it two and three times! I sure hope I have not violated some copyright by printing the picture! These cookies are so good! I found the recipe on Wendy's blog this afternoon and had to stop at the grocery story on the way home to get the ingredients to make them after supper. 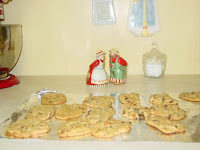 They have toffee and chocolate chips in them and it sure does make for a great chocolate chip cookie. I had to hurry and get a picture as they were disappearing fast! And yes, I was reading blogs at work, but everyone gets a lunch break - right? Here is is the next block in my Golden Rule of Attitudes applique blocks. These sure are fun to make. My next one is "Be Positive" and has an ant carrying a huge cupcake (huge to an ant that is) on his back. I believe that is my favorite block - for now anyway. Hope you have all had a great Memorial Day, although my mother informed me that Memorial Day is supposed to be May 30 and she doesn't know why everything has to keep changing. I had to work today, so it really did not seem like a holiday anyway - except that it sure was quiet in the office. OK, now this is just too weird. I was going right along, reading blogs in the Quilting for Fun webring, when BOOM...I was hit with the evil red x in a box! So, I just typed in a few letters, and presto, it gave me the word verifcation letters. I typed them in, and it told me I had it wrong and gave me new letters.....I did this three times. And then I had a thought, I typed in the letters that were from the previous attempt - they didn't match the current letters, but heavens to Betsy - they worked. Now how weird is that? I am so frustrated with blogger! Most days the word verification is just not there and I can not leave comments. All I see is a box with a red x in it. I have tried entering random letters just to see if it will then give me the word verification code, but still just the red x. Now it seems that when I get the word verification code, when I enter it, I get an error message popup with some weird coded error message. So, I have deleted the word verification on my site just incase some of the others of you are also having the same problem. If I start getting a lot of junk from spammers, I guess I will have to put it back on, but for now...I hope this works. Hope you all have a good Sunday. Yesterday was my 34th wedding anniversary. Love you honey, and hope we have another 34 years to share! Here is my sweet granddaughter who became 3 years old today! My little Japanese Princess. I love you Tess!!! I finished the three french braid rows. The points have to be trimmed off and I need to find some fabric for the ending triangles, but I think they look pretty neat just hanging on my design wall, or maybe I should say half wall. My stove arrived this morning, and I have already prepared my first pot of chili and baked brownies. So much more fun cooking when you have a pretty new stove! Goodnight all - time for me to hit the pillows. Notice anything a wrong in this picture? Yep, I have the center flower on its side. That must have been after I took one of my meds, and that is my story and I am sticking with it. So I guess today I will be doing some froggin' (rip it, rip it). I have 6 more braid fabrics to add, going from green to a dark purple that is in the flowers. This pattern is by Jane Hardy Miller in a book entitled French Braid Quilts just incase you are interested. The kitchen project continues as today my new range and dishwasher will be delivered!!! Geez, I hate to see what lies underneath my old range and dishwasher. This has been an eventful weekend for my family in that my sweet daughter Ellen graduated from Winthrop University today and I am just so very proud of her. It was a great day.....but my baby is grown up! In my unbiased opinion, she is going to be an outstanding, caring, loving, inspiring and well prepared teacher for some very fortunate third graders. Am I the only one having problems leaving comments these days??? Of course, if you are too, you won't be able to leave me a comment to tell me! Lately, whenever I try to leave a comment, in the box where the word verification crazy letters are supposed to be, all I get is a red "x". I have tried right clicking on the x and then clicking on the option to open the picture...nothing. Other times when I have the been able to get past the red x, I get this comment saying that it will not allow me to post an annonymous comment. This makes no sense since I have signed into blogger and have listed my email and password. So what is going on??? 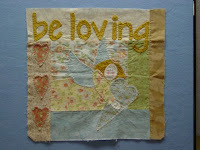 Here is my first block in my Golden Rules of Attitudes - made from the Be Attitudes quilt pattern. I am going for a slightly different look from pattern, using a different pallet of fabrics and outlining my gold words with a shiny gold thread. I have found the most wonderful gold shiny thread - its a new YLI thread called YLI Heavy Metallic. It is soft, not scratchy, and does not frey when hand sewing with it like some of the metallic embroidery floss. Here's a picture of just the words and I think you can see the sparkle the words have a little bit better. I have not tried this thread in machine embroidery or quilting yet - but it is just fantastic in hand work! The fabrics are Faded Memories by 3 Sisters - Moda Fabric. I am ready to start working on my Be Attitude quilt, and have decided to call it the Golden Rule of Attitudes since I am using a gold fabric with a tinge of sparkle for the lettering. I have attached a picture of the fabrics I will use. These were in a FQ bundle that my wonderful friend Darlene gave me one year for my birthday. I would like to purchase some more of this fabric line for borders, but no where on the selvages does it identify the manufacturer or fabric line. I thought maybe one of you out there in blogland would recognize the fabric line and could help me out. They are just gorgeous! Of course, I could force myself to make a trip to the quilt shop where she bought the fabrics and check with the owner. I doubt she still has them in stock as it has been a couple of years but she could probably tell me the fabric line. They remind me of the Paris Flea Market or Shabby Chic lines.